Sometimes there are odors that linger in a home. The bathroom is one of the most embarrassing places to have these lingering odors. Sure, you can cover up smells with commercial air fresheners, but these are full of chemicals you don’t want lingering in your home either. 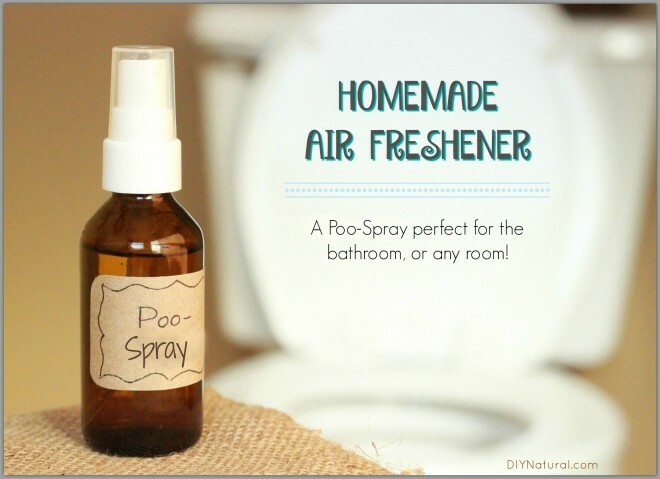 A better, natural alternative is a homemade air freshener–an odor-eliminating bathroom spray that can be kept near the toilet or carried in a bag or purse wherever you go. This is a simple, versatile spray that you can use to remove odors from any area, not just bathrooms. It can be used in the kitchen for cooking odors, laundry rooms for dirty clothing odors, mudrooms where smelly shoes are lurking, or even bedrooms. I use it in my front closet that seems to have a lingering “scent” that probably comes from age. Fill the bottle ¾ full with distilled water. Tap water may contain minerals that could stain surfaces and could have organisms that could lead to mold and bacterial breakdown. Add about a tablespoon of alcohol. This will help break up the essential oils. (Note: You can use more alcohol in your mixture to help poo-spray scent to linger a little longer.) Add 15-20 drops of essential oils and shake well. This can be used as a spray mist or a surface spray. Be sure to wipe the surface down after spraying. For your Poo-Spray you can use a single oil or a blend of oils, such as rosemary and peppermint. Use whatever scent you like. Essential oils are volatile and tend to evaporate quickly, so you may need to spray the area more than once. Fragrance oils can be added if you prefer the scent, but be sure to use a disinfecting essential oil to eliminate odors and not just cover them up. The stronger the essential oil, the longer it will last. Have you used essential oils to help remove odors? Tell us about it! Is there some alternative to the alcohol in the air freshener recipe?